Wisconsin Dells can be considered the Orlando of the Midwest with resorts and attractions continually jockeying to offer the flashiest new water park wonders, theme park thrills and wow factors for families. 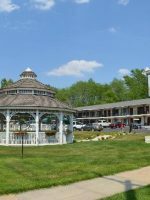 That said, it still retains several thriving throwback motels that are small and family-owned, dating back to the 1940’s and 50’s when station wagons and a push for highways led to a golden era of family road trips. The Black Hawk Motel, run by third-generation owners Brad and Tena Preissel, ranks among the favorites. It exudes a homey charm and hangs onto the old-school values touted by the owner’s grandma: good clean rooms, reasonable rates and always-friendly service. Some of its 76 motel units do have a dated feel, and you might have full beds or one of those slippery polyester bedspreads that slides across the sheets, but those usually have the lowest rates. That said, rooms have been remodeled and updated in an ongoing process since 2009, with another dozen newly finished in 2015. Updates are ongoing when the motel closes from the end of October or early November through mid-March or April. When the weather is warm, kids happily beeline to the playground and splash in the outdoor pool, where a carved likeness of the Indian chief Black Hawk has watched over guests for three generations. Parents and grandparents also get a kick out of the vintage video game arcade, where they can crank up Pink Floyd, Bruce Springsteen and Madonna tunes while showing kids how to win at Ms. Pac-Man or Space Invaders for a quarter. 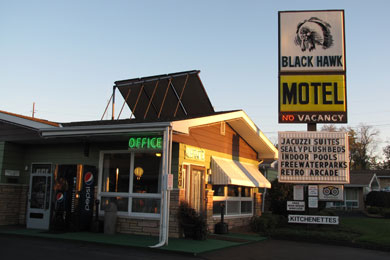 Black Hawk is one of several classic Dells motels near downtown that continue to hold their own despite competition from large-scale resorts near the interstate or along the Wisconsin River. Most of the motel’s brick-fronted rooms are the classic one-story, park-in-front design. They wrap into a square, and the indoor and outdoor pools, game room and children’s play area sit in the middle. There are nine additional cottage units with kitchenettes across the street, plus a full-size home that sleeps six to eight and has a kitchen spacious enough for additional family members from other hotel rooms to gather here for a reunion. Adding to the retro feel are room numbers with the silhouette of Chief Black Hawk on the doors and woven-fabric-and-aluminum-frame folding chairs sitting outside. It leaves you wanting to downshift and recall a time when a pool, hot dogs and ice cream, and maybe a drive-in movie, were all you needed to keep kids happy and have a stellar family vacation. While other properties may cater to budget-minded young adults looking to cut loose for a weekend, the Black Hawk makes it clear this isn’t a partying kind of place — a major bonus for families. There are more than 30 different rooms and configurations at the Black Hawk. Families can choose which one is best for them based on location or in-room amenities. 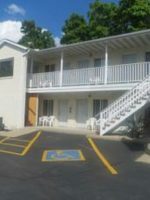 Adjoining rooms and those with kitchenettes are available in some, and all have free Wi-Fi, a mini-fridge, microwave, coffeemakers, TV, DVD player and cable. Guests can request a rollaway for $12 per day. Cribs are $8 per day. Poolside rooms with a queen bed have enough space for a rollaway or crib. These rooms include all the basics listed above and are mostly located in the motel's main one-floor building with reserved parking in front of each room. Configurations include one king, two queen beds, one queen and one twin, two full beds or three full beds, sleeping two to six people. Ask about units that connect if you need additional beds. These are the largest rooms with two queen beds, which make them popular with repeat guests. They were remodeled in 2012 and sleep up to four people, with the option to adjoin with another room. There are a handful of rooms with whirlpools. Most are for two guests, but there is a family whirlpool unit with three queen beds. Another whirlpool unit comes with a second-story balcony with lounge chairs overlooking the outdoor pool. 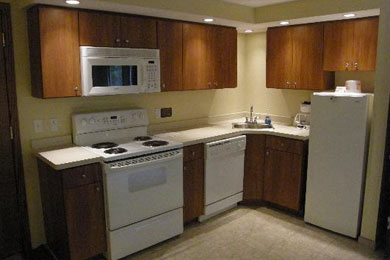 There are several options for rooms with kitchenettes. Choose from two queen beds, three full beds in two bedrooms, or two queen beds adjoining with another room with two queen beds with a kitchenette. If you need more space for kids, room 70 has two queen beds and a queen sofa bed for up to six guests. It can be rented to adjoin with a two-queen bed kitchenette unit. 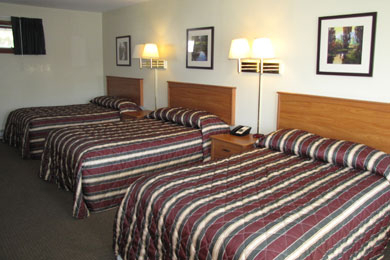 As a two-bedroom motel unit, room 21 fits up to six guests, as well. There's a queen bed in the front room and two queen beds in a back bedroom. These cottages across the street from the motel office have a few different configurations with three queen beds or three queen beds and a full sofa bed for six to eight guests. Some have kitchenettes and can be adjoined. This house across the street from the motel rooms and adjacent to the cottages can sleep up to eight people. It includes a spacious full kitchen, dining room and open living room that make a good gathering place for large family get-togethers. 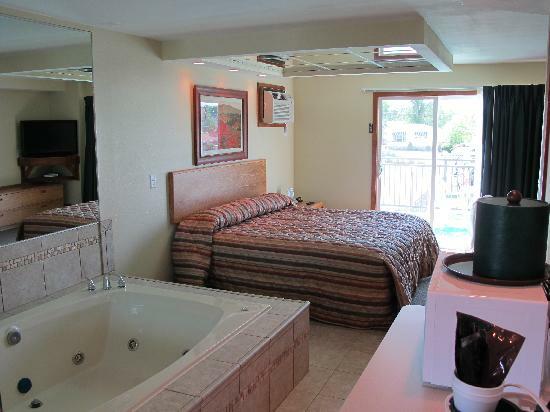 Additionally, Budget Motel Rooms are available, with either one king or one queen bed. They sleep up to two people. Check in was smooth. Room was clean and orderly. Liked the setup where the TV and microwave and bar were. Didn't use the pool or other amenities. Very nice setup all around. Will be staying here again when in the area. Black Hawk guests receive passes to Noah's Ark Waterpark, which touts itself as America's largest outdoor water park, or Chula Vista, a resort with an indoor, year-round water park, plus outdoor fun and a sweet wave pool overlooking the Wisconsin River. Be sure to pack a tote bag, sandals, sunscreen, sunglasses and your own beach towels for visiting the water parks. 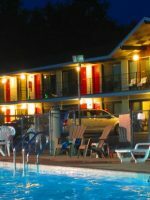 On warm days, you'll see kids swooshing down the Black Hawk Motel slide and splashing around in the fenced outdoor pool. There's even a diving board, which seems to be a rare find in an era where splash parks have turned trendy. Toddlers can cool off in a shallow kids' pool off to the side. Outdoor pools are open from 9 a.m. to 10 p.m. On cool and rainy days, guests can use the heated indoor pool that ranges from about 3 to 5 feet in depth. It's open from 9 a.m. until 11:30 p.m. 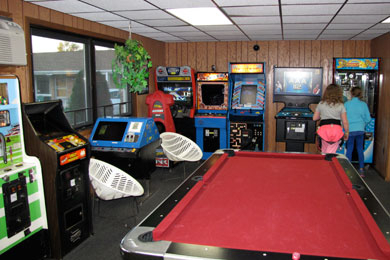 Anyone who came of age in the 1980's should get a kick out of the retro game room. Grab a roll of quarters, kick back in the curvy plastic chairs and see if your kids can master the classics while cranking up the jukebox. You can also queue up the balls for a game of pool. The game room is by the indoor pool, which is handy if some family members prefer pinball to cannonballs. There two play areas on the property, including one that sits between the main office and the outdoor pool, offering a handy place for kids to slide, swing, climb and burn energy on equipment that was expanded in 2013. There's an additional play area across the street by the cottages, plus a public park two blocks away. For moms and dads seeking a soak or steam, there is a whirlpool and sauna just off the main office, both open from 9 a.m. to 10 p.m., plus a sauna that's by the indoor pool that stays open until 11:30 p.m. There is no dining onsite at the motel, but Mitzi's American Grille is one block away at 1101 East Broadway. The menu includes hearty breakfasts, thick shakes and floats, burgers, spaghetti, steak and the ubiquitous Friday night Wisconsin fish fry. Kids' menus are offered for breakfast, lunch and dinner. A four-block stroll to downtown offers a wealth of additional restaurants, cafes and candy shops. Guests can book accommodations with kitchens for cooking their own meals. For groceries, it's about eight blocks to Zinke's Super Market. Additionally, Black Hawk Motel guests are welcome to use the onsite charcoal grills and can pick up free ice at the office for a cooler if they don't have enough space in the room refrigerators. 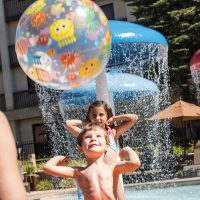 In addition to water park passes, guests are given a Super Splash pass that offers a variety of buy-one, get-one admissions to attractions throughout the Dells and a Passport to Savings pass that's good for 10 to 25 percent off meals, attractions and bonuses at businesses such as Zinke's Super Market. Coin-operated laundry facilities are onsite for guests to use as needed. Onsite parking is free for all guests. Spots are reserved for guests based on their accommodations and location on the property. Guests can check in at 4 p.m. or earlier if rooms are ready and stay until 11 a.m. on check-out day. 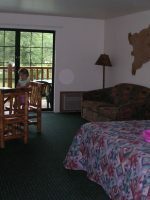 This motel always ranks well for its rates no matter what the season, but if you're especially strapped with a vacation budget, it can be especially appealing to young families with preschoolers and toddlers whose vacations don't have to be wedged around school, activity and sport schedules. 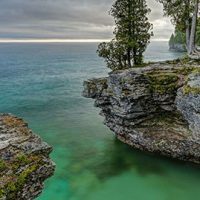 If you can swing an early summer or fall trip before peak crowds hit, you can save even more on lodging and put those savings toward big pancake breakfasts, introducing kids to a drive-in movie, a duck boat tour, or the furry entourage at the Wisconsin Deer Park for a full-blown vintage vacation theme. Spring and early summer weather, as well as fall can be iffy for outdoor swimming, but the motel's indoor pool and Chula Vista's indoor water park keep the fun fairly weatherproof. The motel opens for the season by early April (sometimes earlier) and stays open through the end of October, when you'll see Halloween decorations and candy in the lobby. If you travel during summer's high season, you may be required to stay two nights or pay an additional Saturday-only rate of $10 to $25 during peak-demand weekends and holidays. It's wise to reserve early. With consistently solid reviews on TripAdvisor and accolades for its affordability, weekends at the Black Hawk can book quickly, even in the fall when tourism numbers taper. 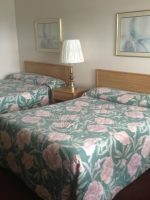 As a plan B, some guests opt for the All Star Value Inn, which was formerly the International Hotel and is now under Black Hawk management. It's about a block from the Black Hawk and is also an older bargain-priced property. You'll need to rent a car if you're flying in from other parts of the country. The closest airport is the Dane County Regional Airport in Madison, which is about 48 miles or an hour away. Other options include flying into Milwaukee's General Mitchell International Airport, which is 125 miles or a two-hour drive away, or Chicago's O'Hare International Airport, which is a 180-mile or three-hour drive. 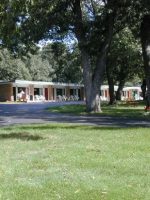 The motel is two miles or about five minutes from the Highway 13 exit from Interstate 94. You'll need a car to fully get around Wisconsin Dells, which doesn't have public transportation. It is possible to walk to downtown restaurants and attractions, and there are a handful of taxi companies available. If parents can sneak away for a date, it's a pleasant stroll downtown to restaurants such as the High Rock CafÃ© with delicious seasonal entrees, such as homemade pastas, creative sandwiches and desserts -- think homemade Kit Kats. If you need to take the kids along, they'll feel welcome (and well-fed), too. Parents can also catch a free shuttle at the motel for the Ho-Chunk casino in nearby Baraboo.